Sam is a wildlife illustrator living in the beautiful Mid North Coast of New South Wales. Growing up amidst a family of bushwalkers, bird photographers and artists, it’s no surprise that her love of art and the Australian bush began at an early age. Since graduating from the University of Newcastle with a degree in Natural History Illustration, Sam has continued to develop her skills as a wildlife illustrator. She has collaborated on projects with museums, art galleries and businesses in both Australia and Canada. 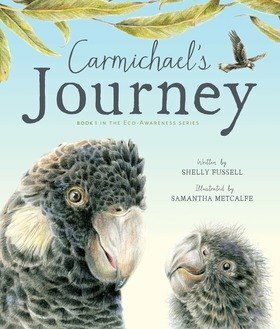 Sam was approached by Shelly to illustrate Carmichael’s Journey as her detailed and realistic style was the perfect match to give visual impact to the story.